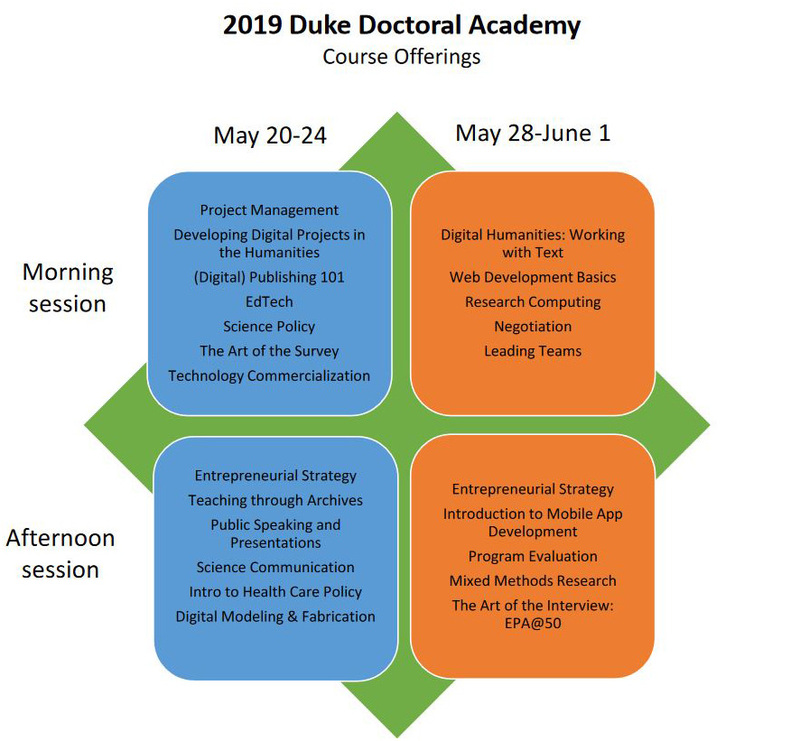 Together Duke is pleased to announce the 2019 Duke Doctoral Academy (DDA), which offers week-long short courses that introduce doctoral students to skills, tools, and knowledge that augment their regular coursework/research. These short courses help emerging scholars prepare for high-level research, innovative teaching, leadership, and/or public engagement. Courses in the Duke Doctoral Academy cover topics not typically included in a doctoral curriculum, or that provide an intensive introduction for doctoral students and postdoctoral fellows who might not have the time or inclination to pursue a full course in a subject. Instructors are Duke faculty members as well as highly trained Duke staff members. The Doctoral Academy welcomes all doctoral students at any stage of their studies and all postdoctoral fellows. There are no prerequisites for any of the courses. Each course meets for three hours a day for five consecutive days. Space permitting, participants may choose up to two courses. Courses are not for credit, but will appear on Duke doctoral student transcripts. None of the offerings require prerequisites or assume areas of knowledge. Instructors will emphasize interactive discussion and group activities/projects to maintain a high level of student engagement. Morning sessions run from 8:30 – 11:30 a.m. Afternoon sessions run from 1:30 – 4:30 p.m.
A complete list of this year’s courses is available here, along with brief a description of each course. Or, click on the graphic below and access the course descriptions for each course separately. Duke Students: Courses will be offered to Duke doctoral students and Duke postdoctoral fellows at no charge. A cancellation fee of $100 will be charged if the request is received on or before 11:59 p.m. on April 30, 2019. If the request to cancel is received after 11:59 p.m. on April 30, no refunds will be provided. All Doctoral Academy classes meet on Duke’s campus. Most classes meet at the Fuqua School of Business; a few classes meet elsewhere on campus. Individual class locations are noted on the course list here. Parking permits are available at an additional cost of $40 per week. Duke Doctoral Students and Postdoctoral Fellows: Registration begins on January 28, 2019 and closes at 11:59 p.m. on May 5, 2019. Non-Duke Doctoral Students and Postdoctoral Fellows: Registration begins March 11, 2019 and closes at 11:59 p.m. on May 5, 2019. We will initially open the program to Duke doctoral students, Duke law and medical students, and postdocs, with slots filled on a first-come, first-served basis. After the initial registration period, the courses will be opened on a space-available basis to doctoral students and postdoctoral fellows at other universities. Non-Duke doctoral students and postdoctoral fellows must provide a website address/URL showing institutional affiliation. All participants will receive a course certificate upon completion. Course participation will also appear on Duke doctoral students’ transcripts. We will not provide transcripts for non-Duke students. Most classes will enroll about 30 students, although some classes may be smaller or larger. Classes with fewer than 8 enrolled students will be canceled. We will hold a social event each week to encourage participants to broaden their peer networks across disciplinary and school lines. 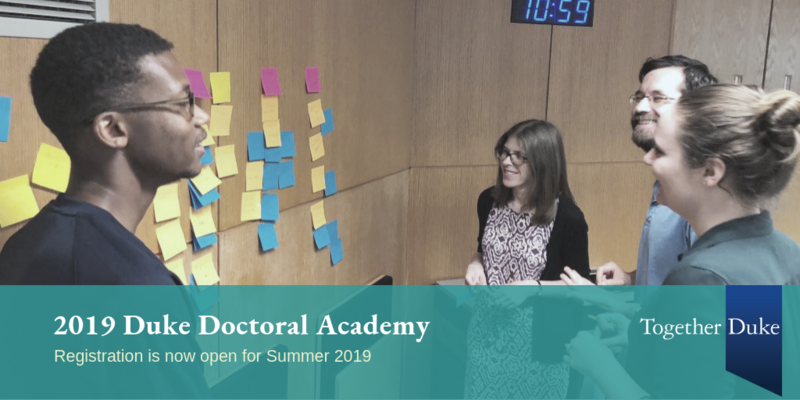 In addition, we are offering the following lunchtime (11:45 a.m. – 1:00 p.m.) workshops during the Doctoral Academy, to highlight resources available to doctoral students and postdoctoral fellows at Duke. All workshops will be held in the Fuqua School of Business, Jenkins Room A&B, with one exception, noted below. For questions regarding the Duke Doctoral Academy please contact Carolyn Mackman at carolyn.mackman@duke.edu. See answers to frequently asked questions. Reflections from past participants are available here, here, and here.